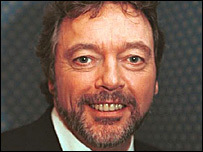 The star called himself an "imagineer"
Jeremy Beadle, who has died at the age of 59, was probably Britain's best-known practical joker. He was a staple of Saturday night television for more than 15 years - in many ways ITV's foil to Noel Edmonds during the 1980s and 1990s. In his most famous hidden camera stunt, he managed to convince Dorset homeowner Janet Elford that an alien spaceship had landed in her back garden. She was so sucked in to the scenario that she sang a hymn to the visitor from outer space before asking it into her house for tea. "The scale was huge," Beadle told Channel 4 in 2005. "We literally cut off half of Dorset." "We had police, the marines, the air corps. It was the biggest stunt that I've ever been involved in." But despite his meticulous planning, Beadle always attributed the success of his pranks to the hapless victims. The alien sketch was only funny, he admitted in 2003, "because the person we played it on was so wonderful". Beadle was born in Hackney, east London, in 1948. His father, a Fleet Street journalist, left before he was born - and the star never made an attempt to contact him out of respect for his mother. After school, Beadle tried his hand at rock music promotion, masterminding the 1972 Bickershaw rock festival. He also became northern editor of listings magazine Time Out, but finally came into the public eye in 1981 as one of the original presenters of Game For a Laugh with Matthew Kelly, Sarah Kennedy and Henry Kelly. With its "Watching us, watching you... Watching us, watching you" catchphrase, the show set the template for Beadle's future TV success - putting ordinary people in extraordinary situations. 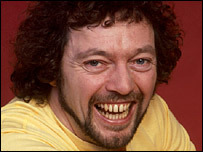 His hidden camera programme, Beadle's About, later became one of ITV's top-rated shows, as was You've Been Framed, which featured viewers' video howlers. But they were easy targets for critics, and Beadle became a byword for cheap laughs and tacky television. In the mid-1990s he was replaced as You've Been Framed host by Emmerdale actress Lisa Riley, and Beadle's About was axed because of falling ratings. He was philosophical about his public vilification, telling The Sunday Times: "I think people are guilty about enjoying the cruelty of comedy which is always at someone else's expense." But, he insisted, people were always affectionate when they met him in person. 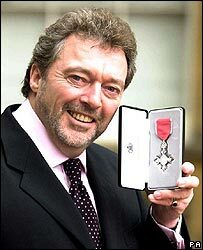 "You'd quite enjoy being Jeremy Beadle, I promise you," he told London's Metro newspaper. "People are very welcoming. They want to chat. Considering the tone in the press, it seems like a contradiction, but it's not." In recent years, the star concentrated on corporate and fundraising events, while writing a weekly trivia quiz for the Independent newspaper. He also worked with US author Irving Wallace on a series of million-selling reference books, including The People's Almanac and the Book of Lists. In 1998, he caused a storm of controversy when he revealed he had helped a friend dying of motor neurone disease to commit suicide. "Trying to talk him out of it wouldn't have been helpful," he told the Mirror newspaper. "If he was going to go through with it, he needed to do it properly." "I feel privileged to have been his friend and proud that I was able to assist his dignified exit. I was his sole confidant and I admired his courage." Although his star faded, audiences' love-hate relationship with Beadle ensured he was never too far away from a TV studio. In 2002, six members of the public were locked away with the star for a week at a time as part of an endurance test for Ant and Dec's Saturday Night Takeaway. He also appeared on Celebrity Mastermind, where his specialist subject was London Murders 1900-1940 and, in 2005, he partnered Sir Alan Sugar on a charity edition of Who Wants To Be A Millionaire. But perhaps his proudest moment came in February 2001, when he was made an MBE for his services to charity. "I was quite moved to be honest. My eyes welled up," he admitted. Beadle's charitable efforts included helping children with Poland's Syndrome, which stunted the growth of his right hand during childhood, and raising more than £13m for the Foundation for Children with Leukaemia, in Barnet, north London. The star downplayed his contributions, saying he gave over his time for "selfish reasons". "It's very easy just to sit back and feel sorry. Well, I hate that, I hate pity. "So I turn it into something very positive. It's very selfish. It's actually stopping me from feeling pity." In recent years, Beadle was plagued by ill health. In 2004, he lost a kidney to cancer and, a year later, he was diagnosed with a mild form of leukaemia. His death comes after a battle with pneumonia. He leaves behind his wife, Sue, daughters Cassie and Bonnie and his stepchildren, Leo and Claire.